Charles James (known as James) was born in Thatcham in 1888, the son of Robert Middleton and his wife Kate née Hobbs. James was their eldest son, but not the eldest child as he had an elder sister Annie Louisa born in 1886. Researching this family uncovers a sequence of tragedies; the 1911 census asked for information on the length of existing marriages and the number of children, living and dead, born to the couple. In the Middleton’s case this showed that only four of their seven children were still alive; apart from James and Annie the other children were: Elsie Clara (1890-1899), Edith Emily (1892-1895), Ellen Daisy (1898-1904), William Robert (born 1901) and Kathleen Ethel (1904). Even worse was to follow the 1911 census when Kathleen died in 1912. Their three surviving children can only have been made more precious by the loss of their four young sisters. One can only imagine his parents’ thoughts when James decided to join the army! The family lived in the parish of Cold Ash at Shaw Fields. This address is in an area that was (and still is) considered a part of Shaw, though it was in essence an extension of Newbury (to which it was transferred in the 1930s). James attended Speenhamland School in Newbury until the age of 13 or 14 following which he would have found employment. In 1904, aged 16, he enlisted in the Royal Berkshire Regiment. Boys of sixteen could enlist and would be trained as soldier, often as buglers or drummers, but would not be expected to fight until they were nineteen. Even today the British Army still accepts 16 year old recruits. By 1911 he was an experienced soldier serving with the 2nd Battalion, Royal Berkshire Regiment in India. The standard term of service for a regular soldier was 12 years, 7 with the colours (ie with his unit) and 5 in the Reserve (back in civvy street but liable to be called up at no notice in case of an emergency). Such service did not start until the solder was eighteen, so James’ seven years would have ended in 1913. Back in England he found employment at the Great Western Railway station in Basingstoke. However, his time as a civilian would not last for long, the Reserve was mobilised along with the rest of the Regular Army as soon as war was declared in 1914. Had James stayed with the army he would still have been in India with the 2nd Battalion and would not have reached France until November 1914 when that battalion landed in France with a Division made up of troops recalled from postings all over the Empire. But James was in England in August 1914 and reported to Brock Barracks in Reading on receiving the call to mobilise. Although he may, initially, have been held back to await the arrival of the 2nd Battalion from India he was sent out to France on 11 September, landing there the following day, among a draft of replacements for the 1st Battalion. This battalion had gone out with the original British Expeditionary Force in mid-August. Having suffered significant losses during the Battle of Mons and the subsequent retreat the 1st Battalion needed fresh men, whether a Reservist had served with the 1st of 2nd Battalion must have seemed far less important by then. James was probably among the battalion’s 3rd Reinforcement ( 1 officer & 92 other ranks) that joined up with them on 21 September 1914. On 6 February 1915 the Reading Mercury listed James as wounded. Such lists were printed a few weeks after the event, so he was probably wounded in late December, early January. The wound may even have been frostbite or trench foot (a serious problem in the first winter of the war). Whatever the problem it was not serious enough to keep him out of the trenches for all that long. In February 1915 the British tried a limited assault on the German line at Neuve Chapelle; initially successful the attack rapidly bogged down, but some territory was taken - which may well have made the British commander, Sir John French, overconfident in the tactics used. The following May the Allies planned their first big combined offensive against the German trench lines. The 2nd Battle of Artois was aimed at pushing the Germans out of a large salient to the north of Arras. The key target was Vimy Ridge, which dominated the area allowing the Germans to see for miles over the French lines. The bulk of the fighting was to be done by the far more numerous French Army, the British contribution was really no more than a diversionary action to inbibit the Germans from using too many of their reserves against the French. The main attack, started on 9 May with French forces attaking the Ridge while the British assaulted the Aubers Ridge to the north. Neither attack made much headway so the British decided to try again at Festubert, a short distance south-west of Aubers, immediately to the south of the ground gained at the Battle of Neuve Chapelle. 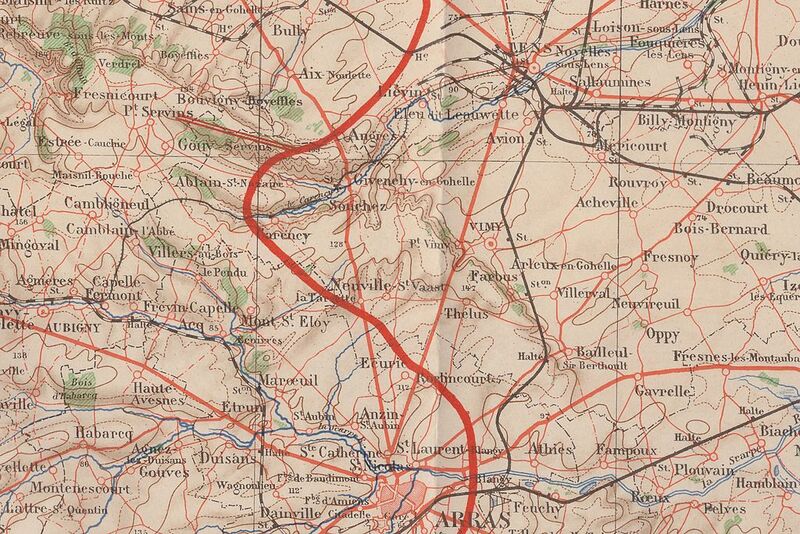 Here the aim was less ambitious: to straighten the line by squeezing the Germans out of a small salient between Rischebourg l’Avoue in the north and Givenchy to the south and stretching west towards Festubert. The Battle of Festubert began at 11.30pm on 15 May 1915 following a three day bombardment of the German positions by 433 guns firing 100,000 shells. Five divisions of the British 1st Army took part (General Sir Douglas Haig commanding): the 2nd, 7th and 47th British divisions, the Canadian Division and the Indian Meerut Division. 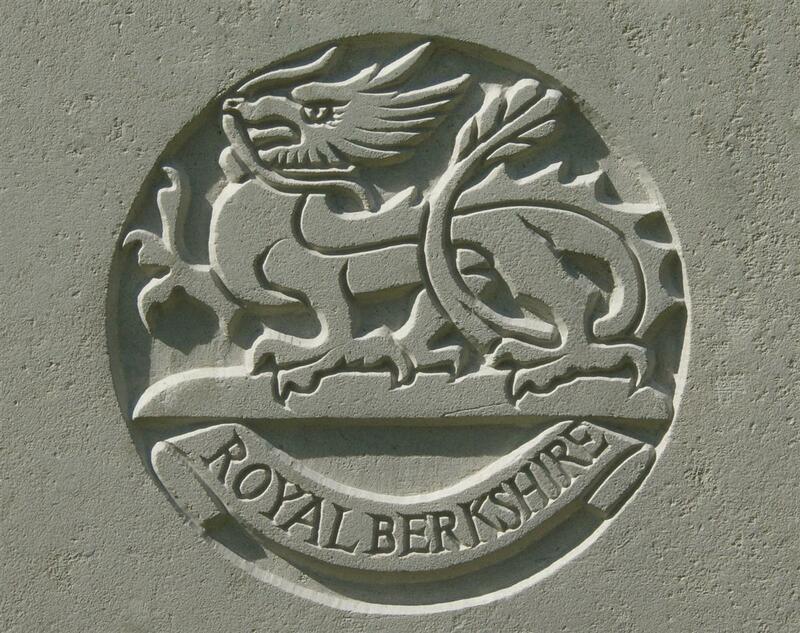 The 1st Battalion, Royal Berks Regiment was a part of the 6th Brigade in the 2nd Division and were in the first wave of the assault going ‘over the top’ at Richebourg l’Avoue at the northern end of the attack. The battalion was successful in capturing its targets (the first two German trench lines), but casualties were heavy (53 dead, 293 wounded and 77 missing). Indeed, the 2nd Division suffered more casualties (5,445) than any of the others involved – sadly one of those who died was James Middleton. This description of his death is a strange one, perhaps a fabrication designed to reassure the family that he did not suffer, but it was much more usual for letters to describe the death as ‘instantaneous’ rather than bizarre. There were instances, however, of dead bodies showing no sign of injury where the death was caused by the shock of a nearby explosion. There is also some confusion as to exactly when he died. The official record is held by the Commonwealth War Graves Commission and sets the date as 16 May – the early hours of which saw the capture of the German lines. However, the Register of Soldiers Effects (showing to whom any outstanding pay, cash and war gratuity were paid), records his death as occurring on 17 May, at which time the battalion was heavily shelled as they waited in trenches awaiting the order to go forward in support of another assault. Perhaps the account of his death fits a little better to the later date? It should have been stated last week that the intimation of the death of Lance-Corporal James Middleton, 1st Berks, was official, his parents Mr and Mrs E Middleton, of Shaw-fields, having received a letter from Lord Kitchener conveying the sympathy of the King. 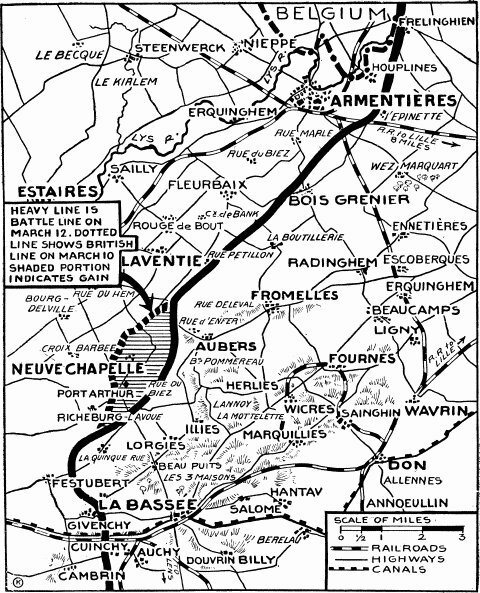 The various sub-battles that made up the 2nd Battle of Artois achieved very little in terms of territorial gains, failing completely to capture any part of the ridge from Vimy to Aubers. Enormous casualties were suffered, but there was one positive outcome; the assault forced the Germans to abandon their offensive against the Ypres Salient (2nd Battle of Ypres) to the north and transfer troops south to the Artois. If the report of the discovery of his body is to be believed it must be assumed that his body was buried. However, its location today is unknown. This is not unusual, later fighting over the area may well have obliterated his grave. As a result his name is remembered on panel 30 of the Le Touret memorial to the missing, very close to Richebourg ‘Avoue. 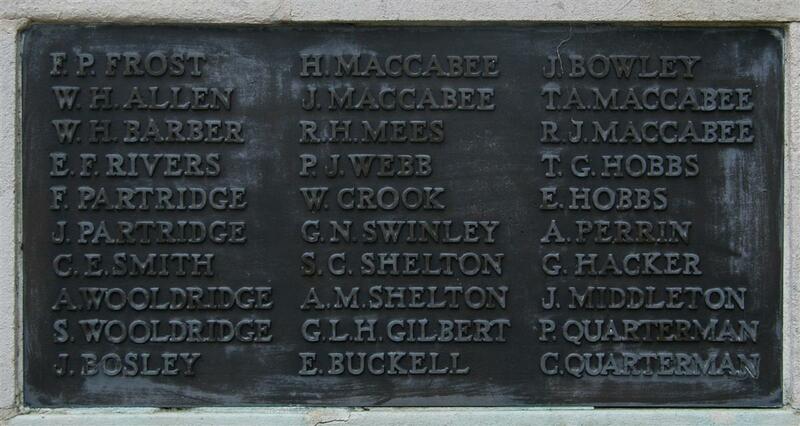 James' name on Newbury War Memorial. Locally the strange position of Shaw Fields vis-a-vis the various local settlements resulted in James’ name being remembered on the war memorials in Cold Ash, Shaw and Newbury (tablet 2), as well as the long lost memorial to the old boys of Speenhamland School. Elsewhere he is widely remembered on the Great Western Railway Roll of Honour. This was printed and distributed to stations all over their network, several copies and reproductions can been seen today. Known examples are in the stations at Birmingham Moor Street, Bristol Temple Meads, Chester, Exeter, Leamington Spa, Newton Abbott, Rosslare and Taunton; and in the railway museums at York, Didcot and the Dean Forest Railway.